Arizona Governor Jan Brewer went to court on Thursday. She filed suit against the Obama administration over its failure to notice that we have a freakin’ border between the United States and Mexico. Governor Jan Brewer just announced . . . . on behalf of the State of Arizona, she is suing the Federal Government. There are 5 counts . . . . and here is a summary (my notes) from the press conference. 1. failure to achieve operational control over the Mexico/Arizona border. 2. failure to protect Arizona from invasion and Arizona says invasion not just limited to other countries to invade but applies to people and secured border. 3. failure to enforce immigration laws . . . . and their failure causes national security risks . . . abuse of discretion that Fed only enforce the law they want to and they should enforce all. 4. declaratory relief about reimbursement for Fed govt’s failure to pay for incarceration of prisoners (illegal). 5. under 10th amendment . . . powers not delegated to the Fed, are reserved to the people and while control of border is fed responsibility, when criminals cross border illegally and commit crimes, it is a state responsibility and the Feds are interfering with the state to fulfill its responsibilities. As highly-trained legal experts, we can see two huge problems with this lawsuit – problems that ordinary people who lack our extensive legal training would probably overlook. First, it assumes that the Obama administration actually recognizes the existence of a border. And second, it assumes that they recognize the authority of the Constitution. Horay for JAN! You go girl! As a resident of Texas, I hope our politicians grow balls half the size of yours and rid our state of the vermin that take money, jobs, housing, etc from legal Hispanic citizens and others. I asked a border patrol guy once why a Legal alien only had to show one form of ID to work, when I had to show 2-3 despite having been born not only in the contiguous United States, but in a military facility on military property. He didn’t have an answer. If the federal govt is over extended it should allow for the state government to protect itself. Binding the states is actually a tyrannical move. I say good for her if anything it makes her look like the underdog. 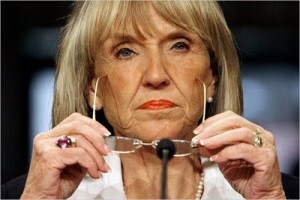 I have to applaud Jan Brewer for standing up for her people. I would have to say, while a lot of people talk a good talk, she’s actually putting action behind her talk. Granted, a lawsuit probably wont’ do anything more than ruffle some feathers, but I’ve got a suspicion she’ll rouse a lot of support from this. I say go for it Jan, and take it as far as it will go. You’re taking action while others sit on their duff and do nothing. I got a hunski that says everyone, YES every single donk politician that says a fence won’t work has one around their own home.Of course, that is different. Awesome point. If a wall and or fence will not work, why not tear down the one around their homes and the White House. That way we are all on the same playing field. Does anyone remember 38 th. parallel,, … I think the China got into wall building once too.. Maybe Pres. Obama send someone over to china to see if they can see their little wall… Think they got real serious about their border.. I Don’t know bout yall ? I think we have military all over the world,, Protecting someone else border … but not ours ? Some thing wrong with that picture. ? Exactly. Why are there still people in the south and north korea border? They have no place there. Let South Korea deal with North Korea, besides there aren’t enough there to do anything of any defensive nor offensive effect. I got no problems shutting down bases all over the world getting the troops back except for those in Iraq in Afghanistan as that is needed at this point in time. What exactly are the troops doing in Japan? They could be here protecting BOTH land borders and protecting the water borders of the continental states as well as Alaska and Hawaii (and the US protectorates). Kimmy-because we are still at war there. That war has never ended/ We have been in a 50+ year cease fire. OK, however, to tell you the truth, I really don’t care. After 50 something years they want to start something South Korea should be able to have an army by now that can take care of itself. If the dude wants to start something then all that South Korea have to do is defend itself and if they want allies to help out then ask for help. In the meantime, the US has no business there not anymore. Keeping all those bases and personnel in other countries cost money and they have it easy as far as I am concerned. I love the military as much as the next person, but I have to say it as it is. I say so because I saw it in Panama. Living the good life and so on, they were angry to leave because they knew they wouldn’t have it that good back in the US. Instead they should be here and do something productive and the keeping the borders safe is doing something productive. All of you need to do some deeper reading into the Constitution and its Amendments. It is the states right to protect its borders, northern or southern, and our federal government cannot, by law, send armed military troops to protect our borders. I am tired, it was a long day at work, I am getting to the “drunk posting” stage of the evening, so I will have to do the checking on which amendment and the additions later make it against the law. Lesson for the day for you youngsters here: Which constitutional amendment made it illegal for the federal gooberment to station military personell along our borders? And, who was the President when the bill was signed into law? In other news, a bunch of Senators are all hot and bothered about the Canadian border. Of course attention should be paid to the northern border too, but couldn’t these slugs get just a little worked up about the southern border? Cowards.